The crow (Latin name corvus) is a common pest around UK homes and gardens. They can nest in large colonies in garden trees and cause fouling and mess on patios and windows. They are also known as pests on farms as they can attack the eyes of sick or trapped lambs and sheep. Pest control is recommended for eradicating colonies of the pest corvus crow. The carrion crow is entirely black and is extremely adaptable and clever. Sometimes wary of humans, it is usually surprisingly fearless. This species of bird will initially cautiously visit gardens in order to scout for food however as soon as they find out what is available they will repeatedly return. Crows can be found almost anywhere across the UK. They can be spotted in city woodlands, moorlands, seaside areas and even in city centres. They can be found throughout the year and eat a whole range of foods including seeds, fruit, worms, insects, scraps and carrion. Carrion crows nest once a year and the young hatch from their eggs in around May. In order to feed their young, they raid other nests to eat the eggs and chicks inside. 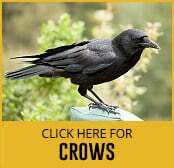 It is useful to call in pest control experts if you find that you have a problem with crows on your property. A professional eradication team can advise on the best way to solve your problem and the methods that would be best employed to help deal with the situation as well as to prevent recurrence.